Perfume Bottle Splitters: Friends or Foes? Recently Elena (Perfume Shrine) has published an interview with Andy Tauer, the owner of and the nose behind Tauer Perfumes brand. I like Andy Tauer and I enjoy reading what he says – in that interview, on his blog and in other media. But there were a couple of points in that interview that made me thinking. Now to your question “Do perfumistas form the bulk of niche perfume buyers in your experience?” No, they don’t. By far not. An educated guess might be: 1/4 of niche perfume buyers in my experience are perfumistas. For sure not more. My first reaction was: “It can’t be true!” 25%? It’s an extremely high estimate. There are not that many of us… Or are there? I started looking around. Probably there are not as many perfume-related blogs as there are blogs about fashion, books or cooking. By rough count we’re talking about a hundred blogs – give or take a few. The largest Facebook group I’m a member of has just 3,775 members. But then I went to two most popular perfume sites/forums. 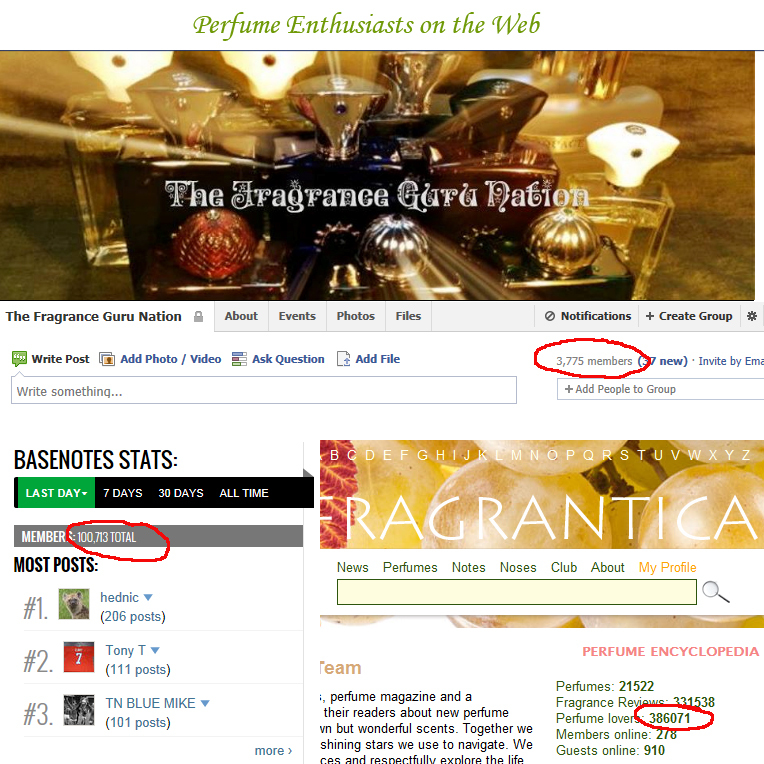 I do not know what Fragrantica calls “Perfume lovers” but 385K+ of those mentioned there. And Basenotes says they have 100K+ members. Of course, those numbers accumulated over time, many of the registered users aren’t active any longer but still it’s a huge number. So unless most of brand’s sales are done exclusively through high-end B&M boutiques, how is one to know what percentage of the sales should be attributed to perfumistas? […] bottle splits and doing decants is pretty much not good and you hurt the creator. It is actually worse than not buying a bottle. […]Getting a decant in a simple spray bottle is nothing of all that. It is like a stripped down to the bones scent experience. The scent is still the same, but everything else that I wish perfume lovers to experience is gone. I feel it would be better, from time to time, to just get one fragrance, instead of 5 splits. First of all, let’s do away with small decants (5 ml) – the size I see a lot in both private decants exchanges and Facebook splits. Nobody sells perfumes without samples and/or testers calculated in the price of the product. And I feel that in case of 5 ml decants we, perfume enthusiasts, are paying our own money for niche brands’ marketing. So that cannot be bad for a brand. A small brand cannot expect too many blind buys (unless you’re an heir of the rich dynasty or a spin-off of a behemoth conglomerate strategically positioned in places where people habitually pay for the novelty itself), so allowing more people to try niche perfumes we increase the probability of the future full bottle purchases. Now to bigger sizes of decants. As a consumer, I do not really care if, acting within the law, I find a way to save money at the expense of an entity that tries to make money off me. But I won’t use that as an argument since as a perfumista I do care about brands and perfumers who produce perfumes that I love, especially when we’re talking about small brands and perfumers who are as nice as, for example, Andy Tauer, Laurie Erickson or Dawn Spencer Hurwitz. But I do not think that selling/ buying decants hurts them. In order for somebody to buy five decants somebody else still has to buy those five bottles. So for each split there is still a person out there who has the “complete experience” – the original bottle, box and a hand-written note (or whatever else the brand chooses to use for creating their universe). I will argue that for people who really cannot afford much, having five decants of perfumes they like is better than having just one, even a super special, bottle of perfume. And these people, once their circumstances change, will buy a full bottle of the perfume decant of which they used up and wished they had more. If more companies followed the suit and released their perfumes in smaller bottles like Sonoma Scent Studio‘s travel sprays or Tauer Perfumes’ Explorer Set (by the way, I was surprised that nobody has mentioned it in the discussion on Perfume Shrine), I would buy only official bottles. For those of us who chooses which full bottles to buy and when to go with a decant, it’s usually not a question of buying a full bottle of the one out of five perfumes, decants of which we entertain using for a while, but rather of not buying any of the five at all. For example, currently there are no perfumes I really want to add to my collection but do not do that for financial reasons. But there are several perfumes that I know I want to get to know better and see if they grow on me. If I can’t buy or swap small decants of those I won’t buy them at all. My conclusion on this part is: if anything, while buying decants we are helping perfumers, not hurting them. We increase the number of full bottles sold and people exposed to the experience brands had in mind while creating their perfumes. And then we talk about those perfumes we got to try. Five reviews should be nothing on the marketing scale of Guerlain or Hermès but I can’t imagine them not being important in our Internet age for tiny brands with no budget for a two-page spread in Allure or a live ballet presentation at Saks. A separate note on experiencing a brand universe. While I like a nice perfume bottle and on a several occasions even went for a bottle of a perfume that I merely liked, not loved, because of the “everything that is around the scent” (see my post Does the size… (strike that) bottle matter? Yep!) and I was one of the first to object to Chandler Burr‘s experiment of stripping perfumes off their packaging and substituting brands’ marketing with his own (see my post (Open)Sky is the limit? ), my experience shows that when it comes to actually wearing perfumes I equally enjoy those perfumes that I spray from the original bottle and from the decant (earlier this year I had a statistics post about it). In the last week’s poll Lucas asked his readers which shape of a perfume bottles they preferred. Most people voted for a “fancy” type, which was a catch-all type for everything that didn’t go into other categories. So the next point I’d like to make is: it’s harder to have any special experience with standard bottles in line. I have to really like the perfume to add a second identical bottle to my collection. With Chanel Exclusiffs, Dior La Collection Privee or Serge Lutens perfumes I feel like after buying one real bottle it’s enough to have just decants for other perfumes from those collections. Had they been unique – like Shalimar, Angel or Flower, – I would have felt a much stronger urge to have them in my collection. So since it’s economically more feasible for small brands to create their universes around standardized bottles they shouldn’t hold a grudge against us for not being too impulsive about buying every next perfume released and finding a more economically sound solutions for experiencing those perfumes. I promise: we’re trying to put them into the best available atomizers and create nice labels. This entry was posted in "Four legs good", Random Stuff and tagged Andy Tauer, decant, Sonoma Scent Studio, Tauer Perfumes. Bookmark the permalink. I didn’t understand the whole “splits hurt the perfumer part” but then again, I’m not a perfumer so most I could do is take his word for it. But I cannot afford bottles of all the Guerlain Exclusives I have as decants and those decants are quite enough for me at the moment. Eventually I might decide to get a bottle of some of them (or one) but I feel quite lucky I can enjoy them for now without going broke over them. Bravo, Undina! Cogently argued – I found myself nodding rather vigorously to the points you raised. 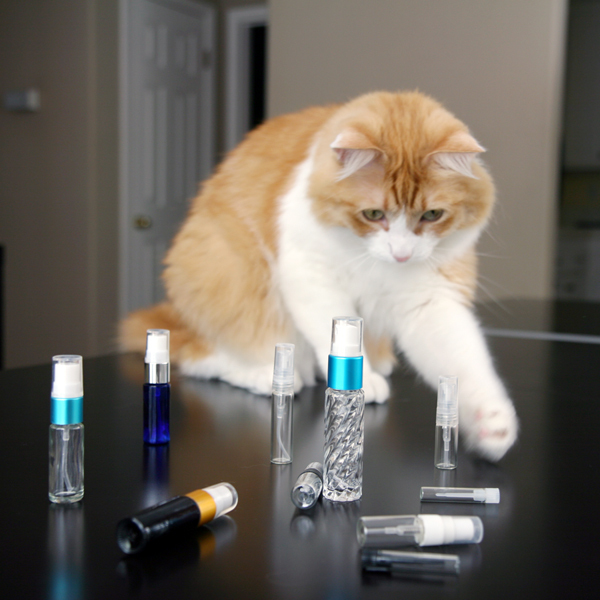 Great post U – I agree with you that as a split, the perfumer is getting a sale. If there wasn’t a split, they might have sold none vs. 1 or 2. Speaking of splits, this perfumista likes to sample (1 or 2ml), but I don’t care for splits. The reason being is that I love the experience of a full bottle and having that as part of my collection. I would rather have few bottles and less juice than a ton of plastic decants with handwritten labels on them. If you have a full bottle, it’s more like a special jewel to be enjoyed from both an olfactory and aesthetic point. Just my 2 cents. I usually go for 5 ml decants (no plastic!) and make my own labels in rare case when a decant comes without a nice label. And if I really like the perfume I will get a bottle. BTW… Rusty is cute as ever! En pointe. So well argued that I do not have a point to add. While I love my full bottles dearly, I am all about the essence. A beautiful perfume stands on its own, every time, stripped to the bones, period. Embellishment or packaging should never make or break a perfume! How is this different than a brilliant band of musicians saying to all the fans who stood in line overnight to get the worst seats in the house that their presence means nothing to them? It’s only meaningful if you are close enough to feel the sweat flying off the lead singer, or be blinded by the special effects, for instance, which would be a completely different experience than being way up in the stands. On the other hand, my husband is a an artist and has never done prints, for example, he thinks that nothing can compare to an original work of art with the touch of the artist’s hand on it. Maybe that is what Mr. Tauer is getting at. I don’t think Mr. Tauer meant to offend his customers, especially those for whom splits are the only way of getting perfumes. And I think that “all or nothing” is more like an emotional reaction on his part than a practical one. But on the emotional level I’d say that I think it should be considered as an honor when people with limited means buy even the smalest amount of your creation – just for the perfume itself. And those who can afford more will be back if the perfume is the one. Couldn’t agree more. And love your cat. Thank you, Sabine (from me and from Rusty who gets a treat for each compliment on my blog). A very well thought out post, Undina. Decants have also been a way for me to get to know the perfume and decide if I want a full bottle. That FB purchase has happened many times and I would not have made the purchase otherwise. If we “collectors” really love the perfume we are unlikely to be satisfied with just a decant. Thank you, Tara. I’m on the same page as you: there are many bottles in my collection that started from a decant. The interview struck me as a little off too Undina, and I’ve bought a Travel set, some Sample sets and a few FBs from Andy but I have also purchased in plenty of Andy juice splits and bought samples elsewhere too. Honestly, some bottles are so good I want them for themselves but in the end the juice is king. I think there must have been some conversation around the topic between the smaller houses at Pitti because he’s not the only perfumer to come out against resellers, splitters and decanters during and after. I have two Tauer’s bottles in my collection and might add another one (even though I do not need a full bottle) just for the bottle itself: I have a red and a green bottle already, so I’m thinking about the blue one – though I do not want a new box, I want the old metal one. New box? I haven’t seen it. You can have one of my metal boxes if you want Undina, I have an empty Auburn one spare. From what I read, Andy is switching to a more regular rectangular cardboard box. The latest perfumewas released in it. If I end up buying the third bottle and it comes in the new packaging, I’ll take you up on your offer. Thank you. No personal offense meant towards Mr. Tauer, but me thinks he doth protest too much. Agree with every sentiment in your piece, particularly this one: ” As a consumer, I do not really care if, acting within the law, I find a way to save money at the expense of an entity that tries to make money off me. ” If niche lines wish us to purchase more full bottles, then they might consider making them a little less expensive. I understand that there are cases where the raw ingredients come close to justifying the price, but let’s not pretend to be dense to flatter the perfumers – most times the price is based on what the market will allow which is trumped up with copy, exclusivity and so forth. As has been mentioned already, if I try it and have to have it, then nothing but a full bottle purchase will do. If it’s not that compelling, then it’s just not. Back to the perfume drawing board, so to speak. Thank you, Sharil. And yes, the perfume will speak for itself – no matter in which vessel it comes. And those that we truly love will end up in our collections the way the creator invisioned them. As a student of marketing, I try very hard NOT to give in to the hype of the products that surround me. Where perfume is concerned, a huge percentage of the purchase price is attributed to marketing: the bottle design and production, PR copy, note cards and sample testers, events, ads, etc. More so, I have to *overlook* the bottle design when purchasing as many are clunky, embarrassingly elaborate or simply not to my taste. Granted, these figures may directly apply to big brands and less so to niche perfumes but, they can’t be far off the mark. I don’t have a huge amount of disposable income but, I do set aside some money each month for samples, splits or decants to indulge my new found love of perfume. In the last year, I have purchased 2 full bottles from my sampling. And, those fragrances have led me to even further sampling of those brands and more FB purchases to come (with birthday money burning a hole in my pocket!). I also initiated a split where in multiple full bottles were purchased from a niche house that is unavailable in the US. Those bottles would have gone unpurchased if it weren’t for the splitters involved. If Mr. Tauer advocates for no splitting/decanting, than to give him what he wants will surely lead to fewer sales for him. I’ll do him a favor by not sampling his juice, that way I will be able to restrain myself from splitting a bottle. I do understand Mr. Tauer’s sentiment: as a creator he wants his perfume to be accepted, admired and enjoyed as the whole. And he is actually involved in all stages of the perfume development, he really cares about the presentation – as well as the juice itself. Moreover, his brandis one of a few that offers not only a good sampling options (you can buy official samples from the site – and it’s a beautiful presentation and enough perfumes to make up your mind about them – or you can buy a single small dab vial from Luckyscent if you do not want to test 5 different scents) but also Tauer Perfumes started selling 15 ml bottles of many of the scents in the line. So in case of this brand buying decants aren’t the only sampling option. Agreed, you make all the points, and the comments do too. It’s not an easy passion when you love a lot of different perfumes. Even if we are not the best or most important customers, it’s still true that we put a lot of time and care into conversation and yes, we spend a lot of time and effort researching and writing for hours for no compensation about the perfumes we love and sometimes cannot afford in full. I agree, Lucy. For many of us perfumes are not only just something we enjoy to use – we’re comparing, investigating and (sorry,Puredistance ;) ) analyzing them. So in many cases decants make perfect sense. I can only add that if I were limited to bottle buys that gave me “the whole experience,” my first couple of buys (blind) would have turned me off those perfumers completely because despite the “experience,” the juice didn’t suit me. Now I always start with decants, and if not every decant leads to a bottle purchase, each bottle purchase is well-loved because it started with a decant. Maybe Tauer feels that there are enough rich princesses in the world to buy up the full bottles unsniffed and not care if they get some duds along the way, but I see it quite differently. I think that Mr. Tauer’s idea (about his creations) was that he would rather we didn’t buy his perfumes at all if we did not like them well enough to go for the bottle. I don’t think he meant blind buys especially since his brands offers samples. I should say that my first decant will become a full bottle once I’m done with the decant and several other decants have already become bottles in my collection. I have to agree with your point of view Undina. If it wasn’t for the splits I would be unable to discover the world of niche perfumes. I myself organize perfume splits. Why? Because I have limited perfume funds as a student and I can’t afford many great perfumes that are more expensive. Splits make my own expense much lower plus I get to share my perfume with others. As you mentioned, someone needs to buy a bottle to organize a split, so when I organize it I do experience the packaging and the actual pergume bottle, so my experience of the scent is complete in terms of what Andy said in the interview. In your case, Lucas, it’s definitely understandable: not only you’re a student but you also live in place with a very limited niche perfumes access. I wouldn’t say that it’s “very” limited. With 4 different niche perfume boutiques around Poland I guess we might have like 200 brands available here. Though – how many of them there are in the world? Thousands! I do not understand the argument that “splits hurt the perfumer”, either. Once someone buys a bottle of my perfume, I don’t care what they do with it, as long as they don’t refill the bottle with crap and try to sell it on E-Bay, which does potentially hurt my reputation. I am one of those people whose collection mainly consists of samples and decants because they allow me to experience a far wider range of perfumes than I could if I bought full bottles. This is why I offer small samples of everything and 5-ml and 15-ml sizes of every fragrance in nice sprayers or bottles. For some people, the “experience” is a fancy 100 ml bottle, for others it’s a simple, attractive 5-ml travel spray. I’m in the second category, so I identify strongly with those customers who want small amounts and prefer to have their purchase in an “official” package, straight from the perfumer. Ellen, thank you for chiming in! I really appreciate when brands offer small sizes and/or plain packaging as an option for those who values the perfume but doesn’t want or cannot afford to buy a bigger bottle. You make many excellent points, Undina! I reread the interview again to make sure I don’t make any impulse/harsh judgement. Having re-read the interview, I understand the points made in the interview. The story that the perfumer wants to convey, etc- I get all that. I have slowly come around to the view that for the perfumes that I truly love, I do want to own the bottles because it adds to the experience. However, there are perfumes that will never be full bottle worthy for me, but that I might buy a split of. And as you pointed out correctly (as did Vanessa in the comment), the difference would be between not buying at all vs buying a decant. Though, I am trying to cut down on decants and save up for full bottles, I don’t see how (financially) that will make a big difference to the perfumer/perfume house [I have seen large numbers of bottles being bought for splits. And I have bought decants of perfumes that would never have been in the contention for FBs]. I also think buying decants often lead to full bottles of perfumes that one thought they didn’t love but which one realizes one can’t live without. This has happened to me. And I think I have less issue with the points made in the interview than the ‘supplemental’ points made in the comments section (by Elena and Andy), many of which seem inconsistent and logically flawed. First of all- it seemed to me in the interview that that Andy was opposed to splits more from a ‘creators’ point of view. In the comments it seems like it was from a business point of view. I think the points you make address both aspects, but I would love to know whether perfumers think splits hurt their business or their ‘creative vision’. Because those are two very different things. And the arguments for one can negate those for the other. Also (and maybe I am nitpicking here, but flawed logic always gets me), Elena mentioned : “Referencing art to perfume is pretty fascinating as a subject, especially when we refer to decantage as an addendum. Because if perfume IS art (and I have some doubts) then would you break up a Miro or a Velasquez in tiny pieces and sell them piece by piece to “highly enthusiastic and educated” buyers, so they can own their own little piece of Miro or Velasquez? I don’t see how splitting a perfume is equivalent to breaking up a painting into small pieces and selling the pieces. That analogy seems laughable. You are still experiencing the perfume as a whole when you split it. Splitting a perfume to me is more like experiencing a painting in a museum, without actually owning the whole painting (but still paying your dues). Here too we are not seeing the painting in the context it was intended [Like in some rich nobleman’s house]. Or financially, it is like borrowing books from the library or buying used books [of course, financially this might also not be great for writers, but that’s a different debate]. I understand that the perfumer might think of the bottle and story as part of the experience, but (if you want to call perfume art), it is not the actual art (unless you are a bottle collector and then you could very well not care about the juice). I guess that means I should resist the urge to reply..I tried but I couldn’t..:) I do understand that metaphors cannot be taken literally and shouldn’t be deconstructed. But when somebody is using a metaphor to make a point and claims that the metaphor is proving said point (and it doesn’t) then I’m afraid I feel compelled to comment..Sorry, I don’t mean to sound argumentative I just wanted to clarify that I didn’t mean to find fault with Elena for using an inexact metaphor but that I didn’t exactly agree with the point she was making. Oh, I understood you perfectly and I agree with the trope you used (I still think it was a simile rather than a metaphor). What I meant was that even though Elena’s comparison wasn’t exact and had faults on the emotional level we understand the notion – even though we don’t agree with it. I can’t really add anything here that hasn’t been said already. A sell is a sell, isn’t it great that more than one person gets to experience wearing the scent? If they find that they like it well enough, they’ll come back for more. And I also like the thought of that when splitting, the juice goes around and actually gets used instead of ending up forgotten on a shelf somewhere. I like your last point about perfume going around and being used. Cogently argued and eminently sensible. I understand the point perfectly about the perfumer as artist wishing to create a total experience, much as a visual artist might with a exhibition, where catalogue, hang, lighting and environment are all important. But after the private view the works are sold and dispersed and stand and fall on their own merit… so with perfumes. An inexact metaphor obviously but I hope my meaning conveys. As for harming the artist… I simply don’t understand how. I think that is the perfect analogy! It also occurred to me reading your excellent comment that the idea that splitting a perfume bottle is like tearing apart a Miro is absurd. Many, many masterpieces become separated from their frames they are not destroyed by this process. Still others are detached from the altars or structures of which they formed an integral part. They may be diminished but are often still held to be great art. Besides, analogies with the concrete arts are always a little misleading (including my own) if we consider classical music… should a piece always be performed inside the hall for which the premiere was commissioned and only by that orchestra. Are all recordings redundant? Really, I think these arguments really are a bit silly when examined. I came up with an additional argument: even if to consider perfume an art, the notes composition itself might constitute art, but produced in batches (even small ones) it becomes a commodity. I think if you were to compare it to a visual art, it would be more accurate to say it’s more like printmaking, in that there are multiples and many can have access it for a (relatively) affordable price as opposed to a fresco or bronze statue or even a piece of conceptual art, or an earthwork. Interesting post here. I am yet to buy a decant as samples have been sufficient in my perfume hunting so far and then a full bottle has come along only if I love it and have the spare cash. Although saying that I have made one blind purchase of Le Temps d’Une Fete as there were no samples offered on the website, and thankfully I loved it. Although I did check the Nicolai website yesterday and it has disappeared so now I wish I got a 100ml instead of the teeny 30ml bottle. Anyway I know what Andy means about experiencing his creation in full but reading here about decanting and splits I totally understand the need for these as well. I’m not sure if Andy fully listed his reasons for his opposition to this but his new Explorer set is perhaps a way to cater to this need. I feel almost bad to attract all that attention to Mr. Tauer’s thoughts because he/his brand is “one of the good guys” – in general and in regards to providing multiple options to buying his perfumes. As I read PdN moved Le Temps d’Une Fete under “limited distribution” -whatever it means, but both Luckyscent and Beautyhabit have both sizes in stock now. So glad you have treated this subject, as I was moving towards doing one myself. As Lavanya mentioned, I was straight in there on Elena’s blog to point out that some scents are simply not FBW for me or any of the splitters – not even the host, though they get to keep the physical bottle, ergo that is all incremental volume. You also make that excellent observation about bottles not being intrinsically interesting. Also -if I already have two bottles by Parfumerie Generale, one more will not excite me. Sorry for typos – travelling atm! I was late to the discussion (work-related backlog of the posts on the reading list) so I decided to do it where I have more time to think of my objections. But I saw your comment there and agreed with what you said. Beautiful bottle doesn’t ensure you a quality content. I’ve been there many times. So nowdays I allow myself to be surprised with gorgeous perfumes in dull bottles ;-). I get more upset when a good bottle is “wasted” on a dull perfume than when a great perfume is hosted in a dull bottle. Hi Undina, fascinating post. I absolutely agree that a decant is not harmful to the perfume house. In particular brands such as Caron and Guerlain (the exclusive collections) are not possible to smell in the North of England, nor are they available to buy as a discovery set. So how do these brands think we are going to smell their fumes unless we buy decants or make a blind buy? Tauer, Olfactive Studio, Histoires et al have got it right by selling good value sample kits. With big houses all bets are off (within the law). They are ripping us off just because they can, I have no respect for them. With small brands I’m much more careful and I wouldn’t want to hurt them. That’s why I thought so much about that topic. Great post, Undina. I think you hit the nail on the head when you said Andy’s reaction was an emotional one rather than a practical one. I don’t pretend to have all the facts, but with the facts that I do have, it is very difficult for me to believe that decants hurt indie perfumers. Andy seems to be seeing decants as the difference between one person (the split sponsor) experiencing the perfume and five people (the splitters) experiencing it by each buying a perfume. As you said in your post, speaking from experience in the community of people who split perfumes, when we really love or like a perfume, we buy a bottle. At other times, we consider a split. So the reality is that decants are the difference between no one experiencing the perfume, and one person experiencing it fully and five people or so experiencing it “imperfectly” (if we accept Andy’s logic). haha- no I see that too, which is why I’m really curious to know (and I hope Andy will answer my question on perfume shrine) exactly in what way he thinks splits harm the perfumer (creatively or financially). Because if it is financial, I’d like to know (and how) since I would hate to harm small businesses such as his. Any time, dear! :) I love when people communicate in comments. I didn’t think about that contradiction (I’m envious you thought of it! :) ) but in my defence I should say that I was so amazed by the faulty Elena’s logic in comments where she manipulated numbers to show how sales whould drop ~10% because of splits – as if the “current” number (let’s assume Andy is right though I’m not convinced) were “clean”, without splits and splits would just start now and effect the total number of FB sales. 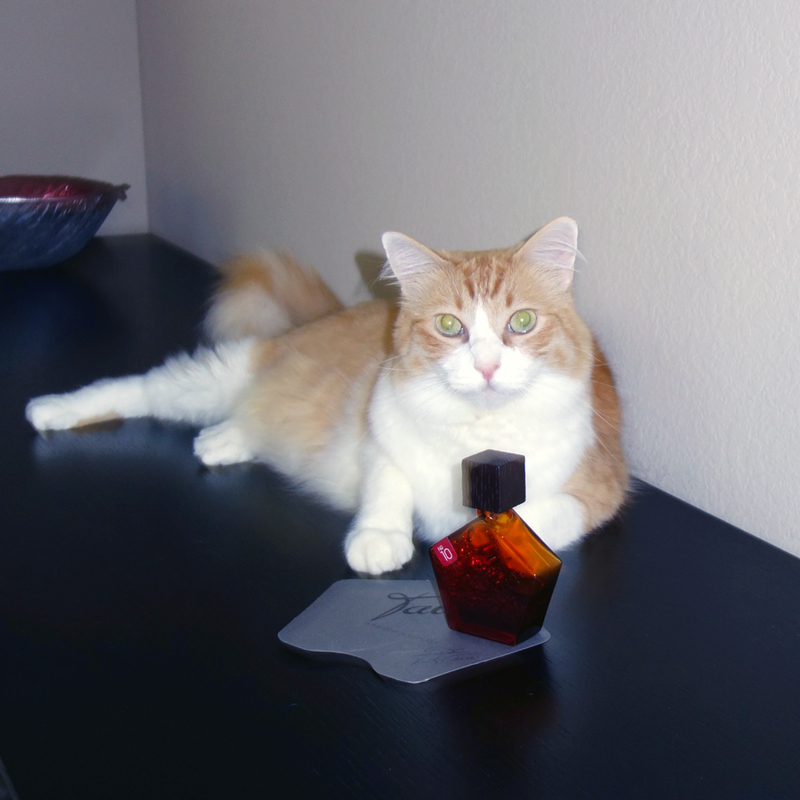 First of all, Rusty’s beefcake pose with the Tauer bottle is priceless! What a handsome boy! I have yet to read the original interview and subsequent comments; however, I absolutely agree with you on decants / splits – this is the difference between “zero” sales vs. at least one sale with the possibility of more over time. I have more comments to make but it is late and will come back. Thank you, dear! Rusty’s cooperation will be rewarded by a treat. If to think about it, with the size of our collections sharing perfumes moves us closer to buying the second bottle – if a perfume is actually “love”. I think the idea was that people are buying multiple perfume decants instead of saving money to buy one but perfect bottle (guess whose ;) ). Emotionally I kind of understand the position but from the economical stand point I think this approach will result in less bottles sold – not even for a specific brand but in total. Yeah, I understand the hurt from the perfumer’s side when people are just buying multiple decants now that you mention it. On the other hand, I frequently ask myself, “Did I REALLY need 100ml of this?” I’d personally like to see houses and perfumers offer smaller bottle options. I can probably count on one hand the 100ml bottles I fully finished. I had only one, slightly tangential thing to add. We’re talking about splits and decants, but samples are a part of a “splitted” bottle too. It’s the smallest possible size, but at its core, a 1 ml sample is split from a larger bottle that was purchased to be separated into pieces. And samples are key for me as a perfume blogger. Without decant services like Surrender to Chance, I couldn’t be a perfume blogger. I have no access to high-end niche brands like Puredistance, Grossmith, and, most definitely, Andy Tauer. Isn’t the blogosphere responsible, in part, for drumming up enough interest in brands like Andy’s such that people will be inspired to want to test them or buy them? I know for a fact that some of my readers went and got samples of Andy’s Une Rose Chyprée because of my review and that one of them is now considering getting a full bottle. How could I have done that without buying a sample from a perfume splitter/decanting service? Going solely off the top of my head in my sleep-deprived state right now, I can point to at least TWELVE full bottle perfume purchases that were solely the result of my review recommendations (from Alahine to Mitzah, Serge Lutens, Profumum Roma’s Ambra Aurea, and more). That’s just the 12 I can think of right now. None of that would have occurred without me having access to a sample that was the result of a full bottle being splitted. So, a split — even at its most minuscule size — can end up being a PR boost that the perfume creators do not actually have to pay for themselves! If anything, they’re benefitting from our financial investment. (Yes, they can be hurt from it too, but the same thing applies to bad word of mouth from a full-bottle purchaser who hated a perfume.) Besides, the old rule is, that there is no such thing as bad publicity, right? Bottom line, splitted samples can lead to free PR and publicity that creators don’t have to pay for. And since small, truly niche brands are highly unlikely to be the focus of a press piece in Elle magazine or Marie-Claire, they’re getting exposure at the blogger’s financial cost of a sample. Doesn’t that add up in the long run to more than what they may have — purely theoretically — lost in terms of full-bottle sales? I think so. I do not think that Andy (or anybody else) would object to “splitting” for samples; I think he meant actual decants for using. With sharing/buing1-2 ml samples we’re definitely helping brands, not hurting them. With bigger decants – probably it depends on each brand, what they offer and where. Even if not to take into the account artistic feelings, I can imagine the circumstances under which a brand (not Tauers Perfumes but A brand) might have been better off financially if splitting beyond samples (if even that) didn’t exist. But for the most niche brands, I maintain, splitting is beneficial. Well… Taking into the account poverty in which Van Gogh spent many years of his life, I wouldn’t be all that surprised if he agreed to paint whatever asked for the right price. Van Gogh aside, since perfumes mostly are bought for the personal use and not to display a flacon as a “work of art” or anything else, I would argue that having sold 5 or 10 ml from a 100 ml bottle to 5-10 people, the original owner rather propagates the perfumer’s “work of art”: while smelling a perfume on somebody, the last thing we think about is how the bottle or the box looks. This was an excellent post. I think it speaks to another reason for indie and niche to make smaller bottles if they truly want our money and want for us to have that “experience”. I agree. And I am “putting my money where my moth is” and buying smaller but more expensive bottles from brands, when those are available, instead of more affordable decants. I am a late joiner. Great points, and with the perfumers openly admitting that it is only about 1-2% within the price, that goes into the fragrance itself, I really don’t feel guilty just to get a 1ml sample or even 0,2 ml with an oud oil sample. Hey 1-2 % is just a statistical margin of error :D.
Lets add another 10 % for the packaging and the flacon, the greeting card that tells “Enjoy”, the design, the industrial and applied arts aspect, the “full buyers experience”, as Andy puts it. The remaining 88% of the price goes into job creation for the manufacturer, marketing departments, finance departments, CEOs and retailers. Bonuses, profits and price margins. Plus if you see that a 1 ml sample vial is about 3-5% of the original full bottle retail price that means you can get 20-30 times more “juice” or scent profile to try out from the same budget. And the creators have in their studios anyhow just plain glass bottles, the scent experience stripped down to the bones. So should I feel guilty at all if I buy samples of a perfume at authorized dealers? I think not. Not more than with all the cassettes, LPs CDs I purchased in retail and watching MTV for hours, instead of going to the concert. Or even buying all the art books and paying the exhibition entry fees at museums instead of buying the original Van Gogh. No hard feelings. But as a perfume fan being squeezed together with another 7,5 billion people, I understand that many other people including perfumers, raw materials producers, chemists, marketing and finance people, corporate lawyers, retailers, workers, logistics people, janitors, facility maintenance, from workers till CEOs must live from every dollar spent, but these people also must understand that I have also a squeezed monthly budget, and I am using the web for gathering information and based on this I make my personal choices and (fragrance) purchases accordingly. Live and let live. It’s never late at this blog :) I stand by everything I wrote at one point or the other, so you’re welcome to join the conversation at any time. While I completely agree with you, I don’t think that Andy was opposing sampling of his or anybody else’s products through decanting those samples from a bottle. I think his point was more about buying bigger decants to wear perfumes. I’m happy with Tauer Perfumes since they are selling smaller bottles now. You still have to find takers for other scents in the set if you do not need several perfumes from the brand but it’s still better than having to buy a 100 ml bottle from other brands. Yes I also bought oftentimes 50 ml instead of 100 ml, since that is also enough from a so-so scent. The argument that you are “more efficient” in the specific ml/USD price if you buy 100 ml instead of 30 ml and even much more efficient if you buy wholesale, lets say 10.000 bottles at a time did strike me rather as a sales argument and never made any sense to me as a private consumer. I agree. Unless I’m in a splitting business (which I’m not), if I won’t get to enjoy all 100 + ml of perfume (which I might not if it goes off before I can use it up considering my current collection), I’m just paying more per ml used – even though theoretically i “saved” per mlbought.